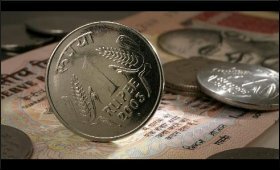 Country's fiscal deficit in the April-January period of the current fiscal touched Rs 5.64 lakh crore or 105.7 per cent of Budget estimates for fiscal 2016-17 - as against 95.8 per cent of Budget in the same period of last year, government data showed on Tuesday. As per the Controller General of Accounts, the deficit, or the gap between expenditure and revenue for the entire current fiscal, has been pegged at Rs 5.34 lakh crore, as compared to the deficit of Rs 5.35 lakh crore in the last fiscal as per revised estimates of 2015-16. The exchequer's tax revenue during the period in question yielded Rs 8.16 lakh crore, or 77.4 per cent of the estimates, while total receipts, from revenue and non-debt capital, during the fiscal's first ten months, were 10.53 lakh crore, or 72.9 per cent of the estimates for the current year. Total expenditure during the April-January period was Rs 16.18 lakh crore, or 81.8 per cent of the entire fiscal's estimate. Of the total expenditure, money spent on plan was over Rs 4.43 lakh crore, while non-plan expenditure came to more than Rs 11.74 lakh crore. The revenue deficit during April-January was over Rs 4.05 lakh crore, or 114.4 per cent, of the estimates. The government had set the target of restricting the current fiscal's deficit at 3.5 per cent of the GDP or to Rs 5.34 lakh crore.